The evidence from insurers’ initial rate filings show that individual insurers have added as much as 20 percent to account for lax enforcement of the mandate and as much as 23 percent to account for the lack of CSR payments. The end result is higher premiums for consumers and higher costs for taxpayers. The Center for American Progress estimates that uncertainty around CSRs and mandate enforcement will raise 2018 premiums for benchmark coverage an extra $1,061 annually for a 40-year-old and $2,491 annually for a 64-year-old. But since these premium increases are the result of Trump’s sabotage, there is still time to undo them. The question is whether the Trump administration and Congress will take the necessary steps to do so. Insurers, insurance commissioners, and actuaries have all been clear that Trump’s efforts to sabotage the ACA will increase premiums next year. America’s Health Insurance Plans, the primary trade association for health insurers, warned that uncertainty around CSR funding would result in “an estimated 15-20 percent premium increase for all consumers in the individual market.” Similarly, the National Association of Insurance Commissioners (NAIC) said that uncertainty over CSR funding could add 15 percent to 20 percent to rates. Actuaries have also been clear that uncertainty would lead to higher premiums. The Congressional Budget Office (CBO) agrees. In a report released earlier this week, the CBO said it projects that if Trump terminates CSR payments, insurers would raise silver plan premiums by an extra 20 percent for 2018 and by an extra 25 percent in later years. The CBO also projects that if Trump halts CSR payments, insurers would exit the individual market, leaving about 5 percent of the population in areas with no insurer at all in 2018. As a result, 1 million more Americans would be uninsured next year. Over the past few months, insurers have filed their initial rate requests for 2018 with state and federal authorities. As expected, the Trump administration’s sabotage is having an effect: The rates filed to date have been significantly higher than the high single-digit to low- to mid-teen increases that experts had anticipated in the absence of uncertainty. California expects rates to rise 12.5 percent next year, but the increase for silver plan premiums would more than double—rising by 24.9 percent—if CSR payments are not made. Pennsylvania rates would rise by 8.8 percent next year in the absence of sabotage. If the Trump administration stops CSRs, however, issuers would raise rates by 20.3 percent, and if the individual mandate is also repealed, rates would rise by 36.6 percent. BlueCross BlueShield of Tennessee requested an average 21.5 percent rate increase. It reports that nearly all of its increase—a full 21 percentage points—is driven by uncertainty about the mandate and CSRs. CareFirst BlueChoice requested a 21.5 percent increase in Virginia, attributing 20 percentage points to lack of mandate enforcement. At the national level, actuaries at Oliver Wyman estimate that, absent policy uncertainty, premiums in the individual market should rise 8 percent to 11 percent next year. However, they project that if the Trump administration continues to sabotage the law, consumers could see premium increases more than three times that level. Oliver Wyman also estimates that uncertainty around enforcement of the individual mandate would add 9 percentage points more to 2018 rates and that uncertainty around CSRs would tack on yet another 11 percentage points to 20 percentage points. Together, these Trump administration actions could add an extra 20 percent to 29 percent increase to 2018 premiums. Using the midpoints of the Oliver Wyman estimates, we calculate that the annual premium for benchmark silver plan coverage for a 21-year-old would be $3,711 for 2018 in the absence of sabotage. 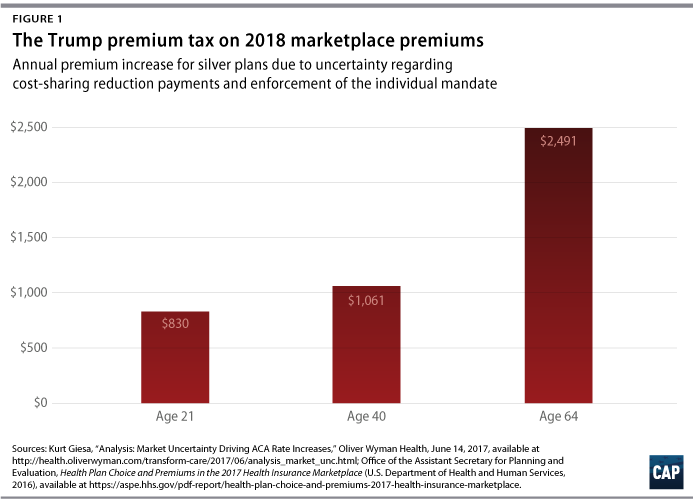 * By refusing to enforce the mandate and commit to paying CSRs, the Trump administration would add an extra 25 percent increase to the average benchmark silver premium for a 21-year-old in 2018, increasing the premium by $830. Older Americans would face even higher premium increases due to uncertainty. The benchmark premium would be an extra $1,061 annually for a 40-year-old and $2,491 more for a 64-year-old. If Trump follows through on his threat and outright cancels CSR payments, the 2018 premium increases could be even higher. 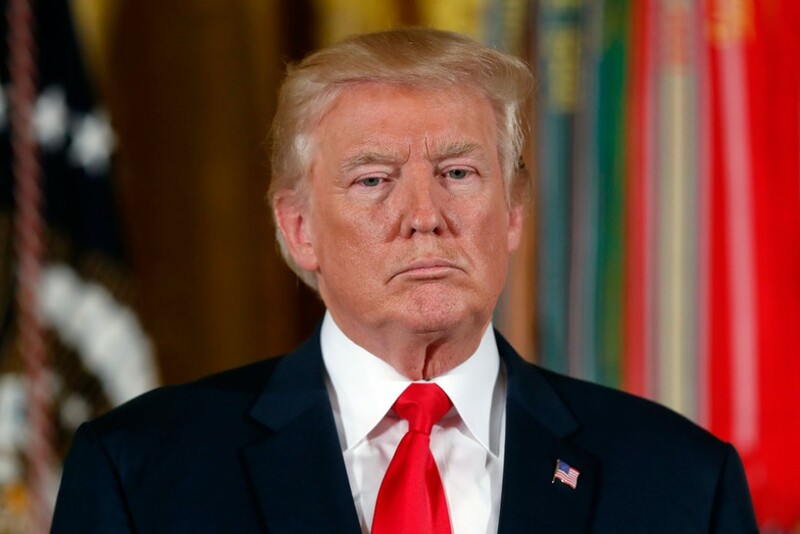 President Trump has proposed cutting funding that supports consumer outreach and health insurance enrollment by more than 20 percent, which would lead to a smaller and more expensive risk pool. He has cut in half the open enrollment period for people to enroll in marketplace coverage and ended long-standing partnerships with a range of local groups who help people to enroll. And he has repeatedly threatened to cancel CSR payments, explicitly saying he would do so to hurt insurers. None of these actions help consumers or improve the health care system. These changes are not only driving up rates but also causing some insurers to leave the market altogether. Fewer issuers are expected to serve the marketplaces in 2018 than in any prior year, due in a large part to the uncertainty created by the Trump administration. For example, Anthem, the largest insurer in the exchanges, announced it would abandon the market in Indiana, Ohio, Nevada, Wisconsin, Virginia, and parts of California and Georgia, citing uncertainty as a major factor. Anthem had said earlier that without certainty by early June 2017 that CSR payments would be funded in 2018, it would need to consider raising rates or exiting markets altogether. By committing to pay CSRs and enforce the mandate, policymakers could bring down 2018 rates for consumers. Time, however, is short. Even though the Centers for Medicare & Medicaid Services extended its deadline, insurers have only until September 5 to file any revised rates for next year, and rates must be finalized later that month. Once 2018 rates are set in stone, the only alternative strategy insurers would have to adapt to further disruptions to the market would be to withdraw. President Trump and Congress have created this uncertainty problem in the health insurance market, and they must be held responsible for fixing it. First and foremost, Congress should pass legislation making clear that CSR payments will be made. Because these payments are already included in the budget baseline, doing so would not cost Congress a dime. In fact, because stopping CSRs raises premiums, the CBO estimates that halting the payments would actually cost taxpayers $6 billion next year and $194 billion through 2026. In addition, President Trump should rescind his executive order directing agencies to undermine the individual mandate or otherwise make clear that the mandate will be enforced next year. The Department of Health and Human Services should also maintain the same level of effort to engage and enroll consumers in coverage as in previous years. Many in Congress have set aside repeal of the ACA and are already considering commonsense, bipartisan steps to undo the effects of Trump’s sabotage of the health insurance system. But they will need to act quickly to ensure that these changes have their intended effect before open enrollment begins this November. Sam Berger is the senior policy adviser at the Center for American Progress. Emily R. Gee is the health economist for the Health Policy team at the Center. *Authors’ note: These amounts do not take account for any applicable premium tax credits.